France is scheduled to hold the first round of elections to the Presidency on the 23rd of April; if no candidate receives a majority of votes in this round, a second round will be held, between the top two candidates in the first round, on the 7th of May. Elections to the National Assembly, the popularly elected and most powerful house of the bicameral legislature, are also scheduled to take place in June, roughly one month after the likely second round of the presidential election. I've written before about France's electoral system, but it is worth summarising the nation's constitutional arrangements at present. France has a semi-presidential system of government, with both a directly-elected President for a five-year term and a Prime Minister responsible to the lower house of the bicameral legislature (the National Assembly). The system is of the premier-presidential sub-type, meaning that the Prime Minister cannot be removed by the President, though they may appoint a Prime Minister. This election follows five years of the presidency of Francois Hollande, a Socialist. Mr Hollande was elected to the presidency, defeating the leader of the centre-right UMP (Union for a Popular Movement) after seventeen years of centre-right control of the office. Mr Hollande, however, has struggled with a stagnant economy and high unemployment, and did not choose to seek re-election. He leaves office with low approval ratings, and with a Socialist Party that lost substantial support in local and European elections during his tenure. The governing Socialist Party held an open primary to determine their presidential candidate. Voters were required to be registered to vote in normal French elections, to donate one euro to the organisation conducting the primary (while only Socialist candidates were likely to win, candidates from minor parties closely affiliated to the Socialists also competed, hence the primary was branded as the "Citizens' Primary"), and to generally accept the values of the left. 1.6 million votes were cast in the first round, a figure which increased to 2 million in the second. The leading candidates for this primary were Manuel Valls, a former Prime Minister, and Arnaud Montebourg and Benoit Hamon, both former cabinet ministers. Valls, considered a more right-wing candidate than the other two, led in early polls, but the first round of the primary resulted in an unexpected first place for Mr. Hamon, who won 36% to 31% for Mr. Valls and 17% for Mr. Montebourg. No other candidate won more than 7%. 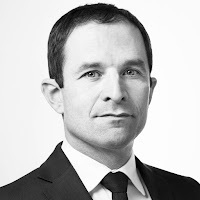 Montebourg endorsed Hamon for the second round, who won 58% to 42% for Valls. Hamon is considered to be on the left of the Socialists, supporting a policy of providing a basic income to all citizens and the legalisation of cannabis. Like the Socialists, the Republicans (a re-brand of the UMP) held an open primary to determine their nominee, in which the general public could vote. The unpopularity of the incumbent Socialist government made it likely that the Republican nominee would have a good chance of victory; hence, there was more interest in the Republican primary. 4.3 million voters turned out in the second round, 4.4 in the second. Also similar to the Socialists, there were three main candidates in this primary. Former President Nicolas Sarkozy and former Prime Ministers Alain Juppe and Francois Fillon. Mr Juppe was the front-runner, with most expecting the runoff to between him and Mr Sarkozy. However, after a strong debate performance, Fillon surged to 44% in the first round, with Juppe on 29%, Sarkozy on 21% and no other candidate above 3%. With Sarkozy endorsing Fillon, he won an easy victory in the second round with 66% of the vote. 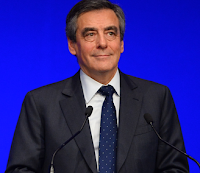 The victory gave Fillon frontrunner status; given the divided nature of the left, it was considered likely that he would face National Front candidate Marine Le Pen in the second round. Ms Le Pen's radical views mean that Fillon would likely win such a runoff comfortably with leftist votes. However, in recent days, he has been beset by a scandal involving his wife being paid for an apparently 'fake job', and his polling has dropped accordingly. It remains to be seen whether he will remain in the race. Emmanuel Macron served as economy minister for two years as a Socialist, but resigned from the position last year, after conflicts with party positions on various matters within his portfolio. He then launched a new political party, En Marche!, and ran for the presidency. He has also signalled his intention to run a slate of candidates for the National Assembly election. Initial polls had Macron in third place, behind Le Pen and Fillon. However, following the Fillon scandal, recent polls have shown him catching up to Fillon, and advancing to the second round, where he receives the support of the centre-right and beats Le Pen comfortably. He stands on a platform of economic liberalisation and general social liberalism, to the right of Hamon and perhaps Le Pen economically, but to the left of Fillon and Le Pen on issues like immigration. The National Front are a long-term minor presence on the French political scene. The usage of the two-round system, where the centre-left and right generally team up against National Front candidates in the second round, has generally led to little representation for the party in the National Assembly. 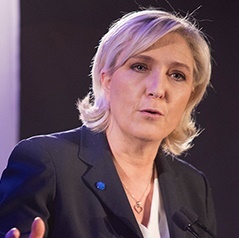 The party's most substantial result in the past was Le Pen's father, Jean Le Pen, reaching the second round in the 2002 presidential election, narrowly beating Socialist Lionel Jospin in a fragmented race. Mr Le Pen's opponent in this round, UMP incumbent Jacques Chirac, received the endorsement of Mr Jospin, and much of the left, propelling him to a landslide victory (82-18). Mainstream opposition to the party comes from distaste of its opposition to immigration and Islam, however, with an increase in concern about terrorism and immigration after the Syrian refugee crisis, the party's stocks have risen. They won the highest number of votes at the 2014 European election, and have performed strongly at lower-level elections throughout Mr Hollande's term. It appears likely that Ms Le Pen will win the highest number of votes in the first round of the election, with roughly 24%; however, most polls have her losing a runoff by twenty points or more to Mr Macron or Fillon. Other candidates in the race include leftist Jean-Luc Melanchon, running with the support of the Left Front (successor to the Communist Party), though his candidacy is under the name 'Unsubmissive France', Green candidate Yannick Jadot, Nicholas Dupont Aignan (who is attempting to fill the niche between Fillon and Le Pen), and various other irrelevancies. Melanchon is the strongest of this group, polling at around 10%. None of the others is higer than 3%. Centrist Francois Bayrou has not yet stated whether he will stand for the election; polls that include him show him at 5%. The two-round system is one of those most commonly used for presidential elections around the world. Much of this is due to many presidential systems (such as those in Senegal and the Central African Republic) being in place due to French influence during colonial times, but the system is used in countries like the Ukraine and Poland because it ensures a candidate will be elected with majority support. Nonetheless, the system has a substantial disadvantage in fragmented elections, which we may see demonstrated in this upcoming vote. In a fragmented election, the possibility exists that two candidates can make it to the second round with little initial support. If an ideological group splits itself between too many candidates, the possibility exists that no candidate representing a substantial ideological group is able to enter the second round. An example of this is shown in the 2002 presidential election. Red candidates represent leftists, blue conservatives, black far-right candidates and cyan centrists. As you can see, Chirac and Le Pen finished first and second, and all voters had to choose between them in the second round. However, 45% of voters, all up, voted for a leftist candidate, compared to 29% for the left and 19% for the far-right. Yet there was no candidate for the leftists in the second round, because of the increased fragmentation of this group. The problem arises because the two-round system does not necessarily provide great incentives for voters to coalesce around two candidates. Left-inclined voters in 2002 may have felt comfortable knowing that they could cast a ballot for a minor leftist, to signify their support for that particular candidate, thinking that Jospin would certainly enter the second round. A first-past-the-post system would mean voters would coalesce between two candidates, at least in theory; often, this squashes diversity in the party system, or leads to candidates being elected with little support. While Fillon's woes have made this possibility likely, it could potentially have been the case that the left, with the backing of roughly 40% of the electorate, would have had no representation in the runoff. This particular issue is partially circumvented for National Assembly elections, where candidates can enter the second round if they receive the support of 12.5% of the registered electorate (on average, this represented 21.8% of the vote cast at the last election). However, the Constitution of France specifically entrenches the top-two requirement for presidential elections. Even so, one of the key advantages of preferential voting for single-member seats (as the Presidency of France is) is demonstrated by this particular alternative; the usage of several rounds of exclusions and transfers results in the candidates in later stages of the count having wider support than their equivalents under the two-round system. The President has the right, after 'consultation' with the Prime Minister and Speaker, to dissolve the National Assembly at any time of his choosing. However, the Assembly's maximum term is five years, meaning that an election must be held by the tenth of June this year. No doubt, such an election date would serve the victor of the election well. The popularity bump incumbent presidents receive has meant that the last three legislative elections, all held shortly after those for the Presidency, have resulted in majorities for the newly elected President's party, a useful tool given that failure to control the Assembly means the President loses control over the cabinet and becomes less able to pass their agenda. This will become an especially important point in the case of a victory by Mr. Macron. His 'En Marche!' party, as a cursory examination of its website will show, spends much of its time discussing Macron's statements alone. He has said he will run candidates for all 477 seats, but the gives the appearance of being a mainly personalistic vehicle, focusing on providing a brand to its lead candidate, far more than any other French party. The Socialist and Republican sites show statements from a variety of other figures, and both parties, despite their weaknesses at this election, do have large legislative caucuses and incumbent members with personal vote factors. Normal behaviour has been for the centre-left and centre-right to form opposing alliances where they allocate seats to parties within said alliances, with the National Front generally not being able to make the second round in most seats due to this tactic (unlike the presidential elections); in 2012, they only entered the second round in sixty-five seats, and won two. If Macron wins, it may well be the case that he forms an agreement with the existing leftist alliance (Socialists+Greens) that would allow the Socialists to have some influence over the new government, while giving some experience and aforementioned personal vote factors to the President. It is still largely unpredictable what will happen at these elections. Perhaps reflecting the irrelevance of such polling until the winner of the Presidency is determined, the most recent poll with seat numbers was taken in June 2016. It had the centre-right winning a majority, and the National Front winning around fifty seats (in normal two-round elections, they have never left single digits; this would be their best result for any National Assembly election). Such a result, which seems consistent with general increases in support for the FN at the local and European level (implying it's not just Ms Le Pen's personal support) would provide a clear reminder of that party's growing influence, even if Le Pen loses.